My skin is looking a little bit dull these days, so recently I've been trying out a new skincare series that I found really helped with the dullness of my skin. About a week ago I received these Papaya series from Valenno which is a beauty brand that you can get via the Rakuten online shopping website. Valenno is a new-to-me brand and this is my first time trying them. But from my experience after using their products for more than a week, I am really impressed with the overall quality of these products. The Papaya series is loaded with papaya extract and Vitamin E as the main ingredients. Vitamin E is an anti-oxidant and is full with nutrients that are good for skin regeneration. It also serves as an anti-aging product, and it also claim to help eliminate fine lines. While the Papaya extract contains a lot of vitamin C to brighten the face and remove dead skin cells. It also claim to help shrink pores, and rich with anti-oxidants as well as nutrients for brightening effect. NOTE: All the Valenno papaya series have a papaya scent but it's not over-throwing so I think it's alright, especially if you like fruity scents. It is a soft foaming cleanser that can lift the dirt off the face and loaded with vitamin B3 and grain scrubs to help exfoliate dead skin and helps remove blackheads as well as shrink pores. The texture is like a hard gel formula with gritty bits because of the grain scrubs. It's a little bit harder to squeeze off from the tube because of the thick formula but you only need a small amount of this to create a full lather for your whole face. I can see an instant brightening result after washing my face with this facial foam. It felt refreshing and my face also felt clean and looks fresh. It also didn't dry my face after cleansing. I really like this one because it seems that it really makes my face clean afterwards but it does not dry my skin. Well I still use a moisturizer afterward but it didn't left a super dry feeling on my skin like when all your oils are stripped off your face. So I think it's a very lovely product to try. What I usually do is I wash my face with the facial foam first, and then I scrub it off with the lightening exfoliating gel, and then I use the face mask the last. 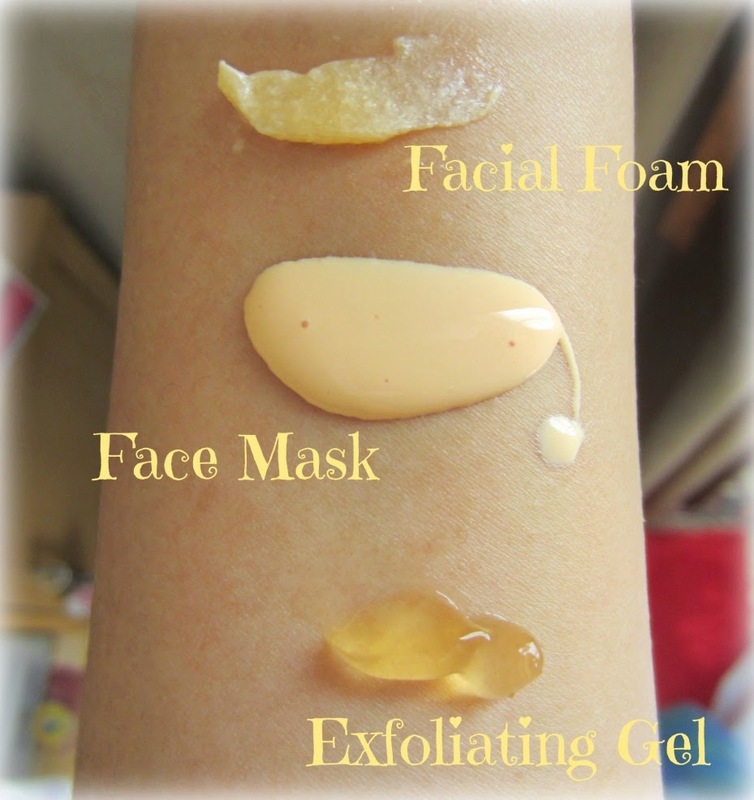 As I told you above, my most favorite is the Lightening Exfoliating Gel, but i recommend all three products that I reviewed above if you're looking for something to brighten up dull skin. You can get Valenno products on their online store at Rakuten HERE.